Africatown Community Land Trust (ACLT), the Black Community Impact Alliance (BCIA), Byrd Barr Place, and Capitol Hill Housing (CHH), will host a ribbon cutting celebration of the Liberty Bank Building on Saturday, March 23rd, 2019, from 11am – 2pm at 1405 24th Avenue. Liberty Bank, founded in 1968 as a community response to redlining and disinvestment in central Seattle, was the first Black-owned bank in the Pacific Northwest. Until it closed in 1988, Liberty Bank provided critical financial services to the community at a time when African Americans and other minorities were often denied opportunity due to redlining and systemic racism. “Today is an important step towards a future that is inclusive of the Black community that has called the Central District home for almost 140 years. We celebrate knowing that we have long ways to go to repair the damages that have been done and realize a truly equitable Seattle,” said K. Wyking Garrett, CEO of Africatown Community Land Trust. Today, the newly-open Liberty Bank Building honors the legacy of the bank that once stood on its site and offers 115 affordable homes for people earning between $13,000 and $65,000 a year, featuring a mix of studios, one-bedroom, and two-bedroom apartments, as well as affordable retail space for three local minority-owned businesses on the ground floor. New residents began moving in this February. The success of the Liberty Bank Building was created through the dedication and support of many community members and organizations with deep roots in Seattle’s Central District. The celebration will reflect the community by bringing together the village that helped this momentous project succeed. Speakers will include community leaders, the partners and funders behind the project, and Mayor Jenny Durkan. The joint effort of the Liberty Bank Building has been hailed as a template for inclusive development, thanks to the groundbreaking Memorandum of Understanding (MOU) between the partners to use the development of the site to address gentrification and displacement head-on and maximize empowerment of the African American community. The partners used an array of strategies to achieve this goal. “This monumental project didn’t just happen, we made plans, visualized, overcame doubts, did the hard things, said no to security, said yes to the unknown and then came LBB,” said Andrea Caupain, CEO of Byrd Barr Place. The MOU secures long-term African American ownership of the building. Central District-based community partners have the first right of refusal for ownership of the building following the exit of the tax credit investor after 15 years. Alongside the MOU partners, there were many more contributors to the Liberty Bank Building’s success. The project development partners: Walsh Construction, general contractor; Mithun, architecture, interior design and landscape architecture; Kantor Taylor; Foster Pepper; PBS Environmental; Perkins Coie; OnPoint Real Estate Services; Pacific Communication Consultants; Al Doggett Studios and the artists mentioned above, and many more subcontractors. The building would not have been possible without those who invested in the vision of affordable homes and community empowerment for the Central District: Heritage Bank; Washington State Department of Commerce; City of Seattle Office of Housing, Office of Arts & Culture and Office of Planning & Community Development; Enterprise Community Partners and Bellwether Enterprise; Lucky Seven Foundation; Impact Capital; KeyBank and KeyBank Foundation; Norcliffe Foundation; Wyncote Foundation NW; BECU Foundation; TEW Foundation; The Ariel Fund; and dozens of individual supporters and board members. Throughout construction, this development also prioritized local and minority subcontractors. Of the $16.7 million available for subcontractor work, more than 30%—over $5 million—is going to Women- and Minority-owned Businesses, substantially beyond the partners’ original 20% goal. Over $2.9 million is going specifically to Black-owned businesses. The building reaffirms the Central District as a hub of the pan-African community. It stands as a living marker of community history and resilience. Critical input was gathered from an advisory board of the descendants of Liberty Bank founders and Central District neighborhood leaders: Jocquelyn Duncan, Derryl Durden, Michelle Purnell-Hepburn, Merle Richlen, George Staggers, and Pastor Reggie C. Witherspoon. They helped ensure that the building now tells the story of the Liberty Bank through art, historic documents, and architecture. Led by Co-curators Al Doggett and Esther Ervin of Al Doggett Studio, a team of nine local Black artists (Lisa Brown, Minnie Collins, Al Doggett, Esther Ervin, Aramis Hamer, Lisa Myers Bulmash, Lawrence Pitre, Ashby Reed, and Inye Wokoma) developed art installations to honor the legacy of Liberty Bank and celebrate the vibrancy of the Black community in the Central District. Over the course of the project, events were held to promote the artists’ work. The total investment in the building’s art program is over $250,000. In conducting the residential lease-up, the partners helped to affirmatively market openings to those who may have been displaced from the neighborhood. For the commercial space, they worked closely together to develop and support Black-owned businesses and ensure affordable commercial space. “It’s been an incredible experience to witness and participate in the creation of the Liberty Bank Building as a community asset for the Central District. 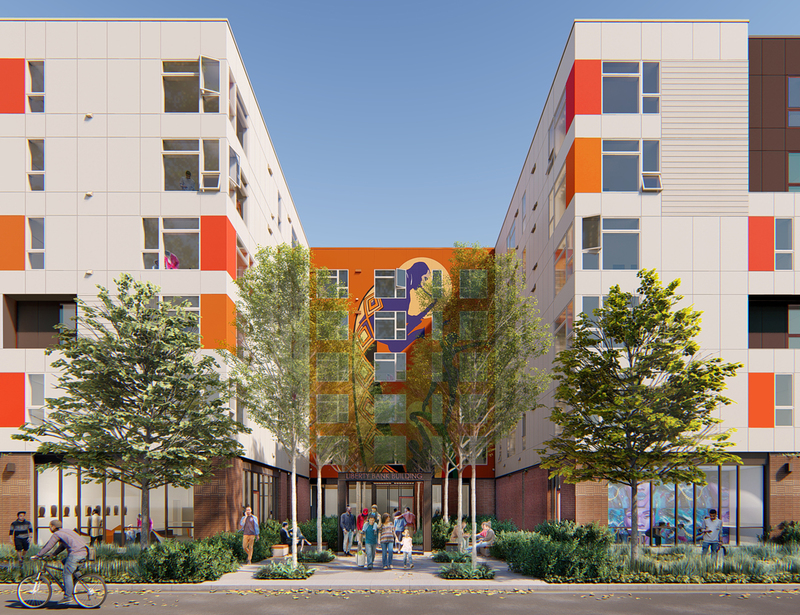 Its existence honors the legacy of an important institution and ensures that the history that surrounds it will not be erased,” said Christopher Persons, CEO of Capitol Hill Housing.